Thursday and Sunday's games have come to an end, providing a very high scoring week for many fantasy owners. Let’s review some of the best and the worst fantasy performances from Thursday and Sunday’s matchups in Week 4’s Fantasy Football Wrap Up. Deshaun Watson finished as the highest scoring quarterback of the week throwing for 283 yards, 4 touchdowns and 1 interception against the Titans. 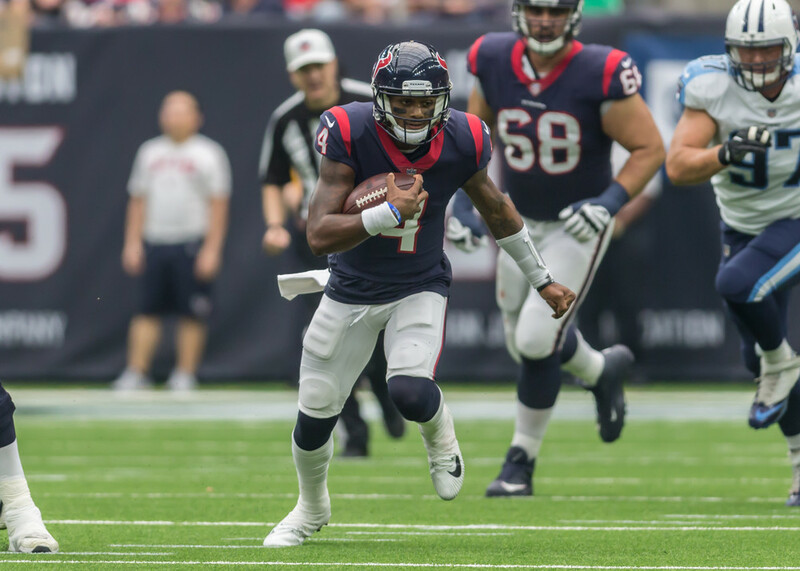 Watson’s ability to run helped him again this week as he ran 4 times for 24 yards and a score, totaling 33.72 fantasy points. Cam Newton had a monster game as well as he threw for 316 yards, 3 touchdowns and 1 interception. Newton was out of the pocket often, running 8 times for 44 yards and a touchdown. Newton finished as the second-highest scoring quarterback of the week, totallng 33.04 points in an upset against the New England Patriots. DeShone Kizer was pulled in favor of Kevin Hogan after throwing for only 118 yards and 1 interception. Kizer wasn’t able to find room to run during this matchup, as he only totaled 10 yards on 5 carries for a grand total of 3.70 fantasy points. Jay Cutler failed to take advantage of a QB-friendly matchup against the New Orleans Saints, throwing for 168 yards, 0 touchdowns, and 1 interception, while rushing for 5 yards on one scamper, totaling 5.10 fantasy points. Le’Veon Bell finally produced for owners this week after being given a heavy workload, rushing for 144 yards and 2 touchdowns on 35 carries. Bell also caught 4 passes for 42 yards, totaling 34.60 fantasy points and finished as the highest scoring running back of the week. Todd Gurley finished the week as a top-2 running back once again, carrying the ball 23 times for 121 yards. The Rams were rewarded after continuing to involve Gurley in the passing game, as he caught 7 receptions for 94 yards and a touchdown for a total of 34.50 fantasy points. Marshawn Lynch finished Sunday’s matchup against the Denver Broncos with an abysmal 12 yards and 9 carries and failed to catch his only target, finishing with a mere 1.20 fantasy points. At this point in time, Lynch cannot be trusted, especially in PPR leagues where he provides little value as the Raiders have many capable pass-catching backs. Isaiah Crowell only scored 3.70 fantasy points this season after running for 20 yards on 7 carries. Crowell should be a flex-play at best moving forward, as he has only surpassed 40 rushing yards (44) once this season, and averages 6.35 fantasy points this offseason, compared with teammate Duke Johnson who is averaging 14.60 points through the first 4 weeks. DeAndre Hopkins finished Week 4 as the highest scoring wide receiver. Hopkins caught 10 of his 12 targets for 107 yards and a touchdown, for a total of 26.70 fantasy points. Hopkins’ value in full-PPR leagues is second-to-none due to the number of targets he receives every game. Devin Funchess was the recipient this week against the Patriots’ atrocious defense, hauling in 7 catches for 70 yards and 2 scores for a total of 26.00 fantasy points. While Funchess won’t be left wide-open every week, he will still be covered by the second or third-best cornerbacks on a weekly basis and can provide a floor during bye-weeks that begin starting next week. Amari Cooper continued his disappointing fantasy season with 2.90 fantasy points, after only being able to haul in 2 of 8 targets for 9 yards against a tough Broncos secondary where he was constantly double-covered. Business was not booming this Sunday, as Antonio Brown only caught 4 balls for 34 yards. Brown only totaled 7.40 fantasy points and left owners wanting more as teammate Le’Veon Bell was the focal point during the Steelers’ win against the Ravens. Tyler Kroft, filling in for an injured Tyler Eifert, was able to take advantage of his opportunity against the Cleveland Browns, hauling in 6 receptions for 68 yards and 2 touchdowns. Kroft finished the week as the first-ranked tight end with 24.80 fantasy points and could hold value if Eifert remains sidelined moving forward. Start of the Week Cameron Brate carried on the streak of tight ends scoring against the New York Giants defense (as did teammate O.J. Howard). Brate caught 4 of his 6 targets for 80 yards and a touchdown, totaling 18.00 fantasy points on the week. Jason Witten followed up his 1.30 fantasy point performance in Week 3 with another dud, scoring only 1.90 fantasy points on 1 reception for 9 yards which was disappointing considering the Cowboys were able to move the ball with relative success and scored 30 points in a loss against the Rams. With Willie Snead still out of the line up, Saints’ Coby Fleener had his second consecutive game with only 21 receiving yards (this time on 2 receptions instead of just 1 last week), showing owners that the first two weeks of the season where he averaged 14.35 fantasy points was just smoke and mirrors. The Houston Texans Defense and Seattle Seahawks Defense both finished the week with 22.00 fantasy points. The Texans had 2 sacks, 4 interceptions including 1 pick-6, and 1 fumble recovery against the Tennessee Titans. Against the Indianapolis Colts in Prime Time, the Legion of Boom finished with 3 sacks, 1 interception returned for a pick-6 and 1 fumble recovery for a touchdown. The highest scoring kickers from this past week was Greg “The Leg” Zuerlein who kicked a whopping 7 field goals from 28, 30, 33, 43, two from 44, and 49 yards out, and 2 extra points, amassing a total of 27 fantasy points. The second highest scoring kicker in Week 4 was Jake Elliott 4 who booted 4 field goals from 40, 45, 47and 53 yards out while kicking 2 extra points for a total of 19.00 fantasy points.